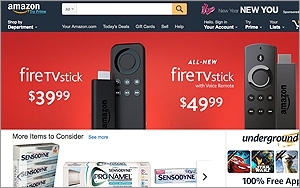 Amazon released insight into its Sponsored Products ads Tuesday, estimating that global adoption grew by 100% among Amazon sellers in 2015. The ads drove more than $1.5 billion in sales globally last year. During the holiday shopping season, clicks on Sponsored Products in the U.S. rose 200% compared with the prior year. The data was included in a slew of growth stats for 2015, including updates on the popular sponsored product advertisements have become on the e-commerce platform. Amazon made several updates to Sponsored Products that helped drive these increases. The offering added placements to better reach customers including the first row of Search, Mobile Shopping App, and a second Product Detail Page carousel. It also added new tools to help sellers save time and manage their advertising spend, including Bid+, an API, and Bulk Sheet uploads. During the holiday season, Amazon estimates individuals and businesses selling on Amazon sold to more than 80% of Amazon customers worldwide who ordered a physical item. Fulfillment by Amazon items shipped worldwide grew more than 60% year-over-year during the holiday season, delivering more than 1 billion items worldwide -- and helped to support all the clicks and sales generated from Sponsored Products.